All bicycle users are required to park their bicycles at the designated bicycle parking bay. No bicycle is allowed to park at motorcycle parking bay. 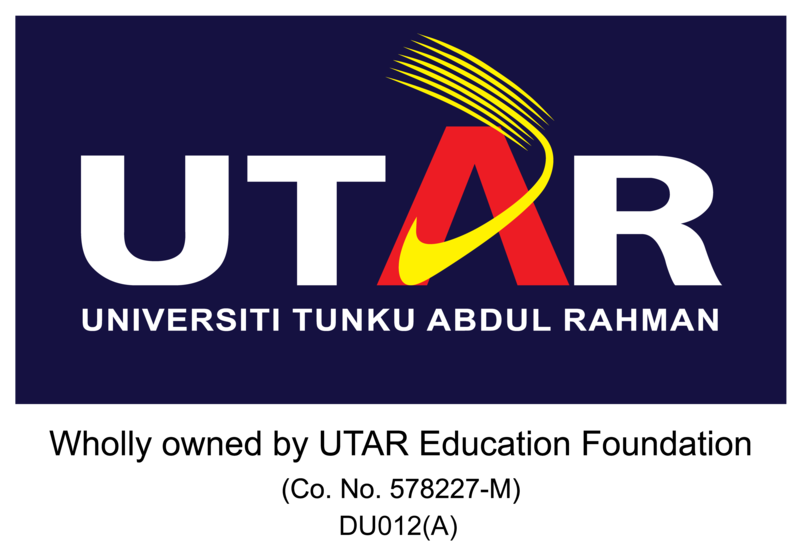 UTAR vehicle stickers are to be used by the designated vehicles only. It is prohibited to transfer the UTAR vehicle sticker to another vehicle, which is not owned or used by the sticker owner. Selling or buying of any valid or fake sticker from third party or any other sources such as Facebook are illegal and is not permissible under the Law of University. Making , possessing, or using any falsified , torn or defaced University document or record ;altering any University document or record, University vehicle sticker etc. is an offence under the Law of University. Students who are involved in any invalid transfer and falsifying UTAR vehicle sticker will be charged under Student Code of Conduct [“the Code’], whereby if found guilty, the penalty may extend to dismissal from the University. 1) Don't get so engrossed in the game that you lose awareness of what's happening around you. 2) Be cautious any time you share your location through GPS technology. 3) Be aware of your personal safety when out looking for Pokemon. 4) Watch where you are walking, be aware of your surroundings and do not walk out into roads without looking. 5) Do not play the game and drive any vehicle or ride any personal mobility device at the same time. You cannot do both safely. 6) Do not trespass onto restricted areas and private properties. Do not take pictures of restricted areas. 7) Be aware that you are potentially sharing data with others; there could be potential criminals who may seek the opportunity to lure victims to their fake "Pokestops". 8) Never reveal your personal information and watch out for fake apps or cheat tools. Cyber criminals can access your personal data to commit fraud or hack into your phone with viruses and malware. If you wish to verify photocopies of your documents such as certificates or application forms, you may proceed to the below offices for the specified purposes. The Perak government has declared a total ban on the usage of polystyrene containers and plastic bags with effect from June 2017. Starting on January 2017, all cafeteria and push cart operators of Kampar Campus will start implementing this practice. All staff and students will have to use biodegradable containers or their own shopping bags then. There are landlords and house agents who may have made many partitioned cubicles (rooms) in their apartments and choose to rent these partitioned rooms especially to students. Landlords put up partitioned cubicles (rooms) to maximize their income. Please note that the MBKj and the Housing Association Committee may not approve such partitioned cubicles (rooms). These partitions may be illegal if no prior Municipal approval has been obtained and it may be a fire hazard due to poor electric wiring. The air circulation may not be good either due to some of these rooms not having any windows. The Housing Association Committee (probably with the Municipality intervention) may get the landlord to demolish these partition and the students of such rooms may risk being evicted. It is advisable that all students do not fall prey and rent such premises. 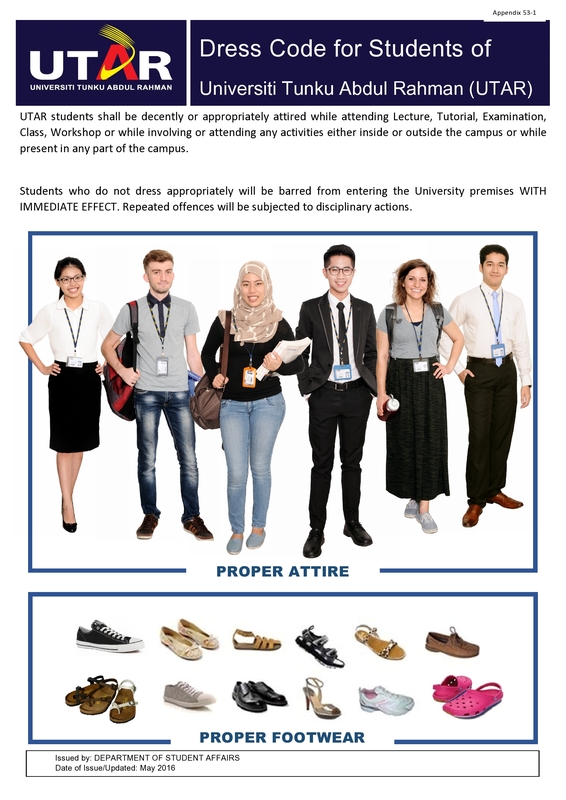 Please note that any type of smoking whether it is normal cigarette smoking, e-smoking or "vaping" (even if there is no smell), is strictly prohibited inside the building or outside within the perimeters of the university. If any student is caught, the student will be subjected to student disciplinary action. There have been a few cases of drowning at the Batu Berangkai waterfalls recently. All staff and students are strongly advised to be careful when going to the area, especially during the raining season. Due to safety regulation as fixed by Jabatan Pengangkutan Jalanraya (JPJ), with immediate effect, all UTAR buses will only be allowed to take in the number of students as per allowed. Thus, there shall be NO students allowed to stand in the bus. 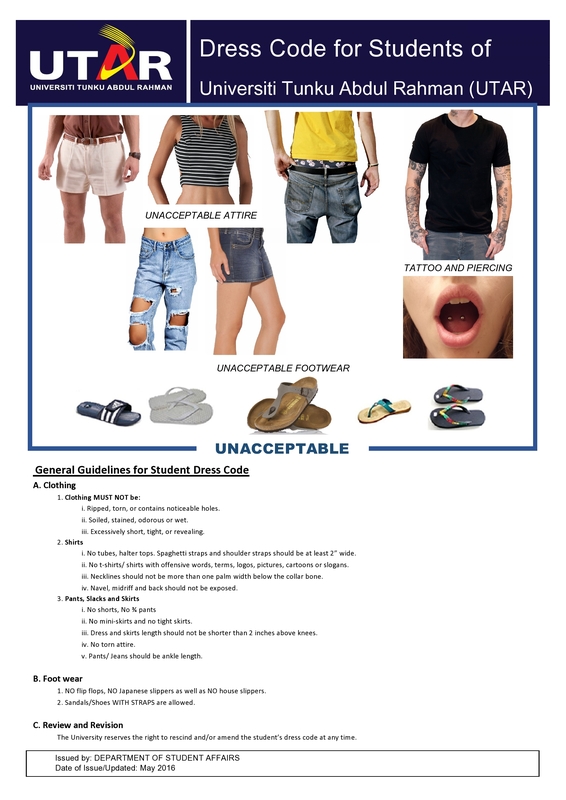 Please take note on the above. Thank you. (a) Air condition operating hours in PK campus to be limited from 8am till 6pm for all academic buildings except Library, Faculty of Business and Finance and Lecture Complex II. could be used. Usage of lecture halls/rooms must satisfy 50% occupancy. Please be informed that ONLY pedestrians in PROPER ATTIRE are allowed to use the TAR UC- UTAR access gate as below. Cyclists are NOT allowed to use the access gate.